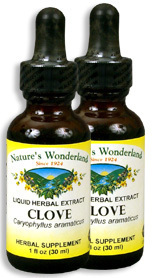 Clove Liquid Extract - Syzgium aromaticum, 1 fl oz / 30ml each (Nature's Wonderland) - Penn Herb Co. Ltd. While many recognize the scent of the Clove essential oil from the dentist's office, the aromatic extract is also used to numb gums. Get the comforting results you need with our fast-absorbing extract. ALSO KNOWN AS: Clavo, Clou de girofle (French), Kariofilla (Greek), Kruidnagel (Dutch), Syzygium aromaticum. AMOUNT PER SERVING (125 mg/ml or 15 drops): Certified Organic Clove Buds (Caryophyllus aromaticus). OTHER INGREDIENTS: Grain Alcohol (45-55% by volume). Free of: milk, dairy, egg, fish, shellfish, tree nuts, peanuts, wheat, gluten or soy. 5-15 drops in water or juice, 2-3 times daily or as needed. Shake well before using.